NOTE:This Field trip has been re-scheduled to July 6 (originally July 13). 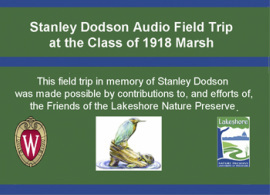 Free public field trips are one of the most valuable contributions the Friends make to the Preserve. They have been organized every spring and fall for over 10 years on various topics and are all led by Friends volunteers. Many are professional naturalists and emeritus faculty and staff. The Friends also partner with other environmental organizations for field trips. The 1918 marsh and behind it the playing fields.